This blog was originally posted in March 2017 by Museum intern Rachel Hoffman. With Purim coming up again, we thought we’d repost this short and sweet family story from our former Visitor Services Associate Sharon Stein. Enjoy! 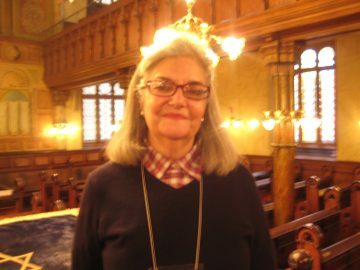 Sharon Lotman Stein is the first person you meet when you enter the Museum at Eldridge Street. She runs the admission desk Monday through Wednesday. With the Purim holiday coming up, everyone was thinking about the ways they’d celebrated over the years. When I sat down with Sharon, she told me her own personal Purim story. Sharon’s handwritten hamentashen recipe from her mother. Food and drink can represent so much about our history, memory and love. We hope you share your own holiday traditions with loved ones this Purim – and everyday! We’re so grateful to Sharon for sharing this beautiful piece of her life with us. Interview by Rachel Hoffman, intern at the Museum at Eldridge Street.